Bill, aka Goodbye Bill, is a 10-year-old fawn male born March 12, 2001. His sire is Tobacco Road, and his dam is Ion Lov N Touch. Bill has 17 races to his credit on Greyhound-data.com starting in Iowa on October 12, 2002 and ending in Arizone on June 22, 2003. 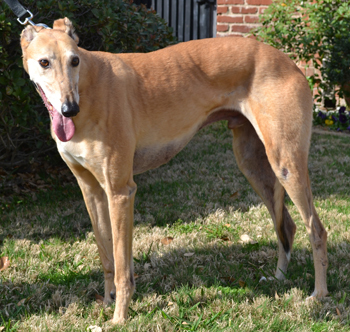 Bill was in a home along with Ampsy for several years, but sadly has been added to the GALT family due to relocation and financial difficulties. Please help find Bill his final forever home! Bill is cat and small dog tolerant. 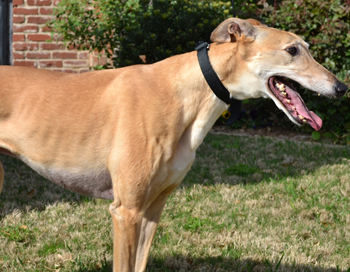 Bill is a handsome, reserved boy and has come a long way from a timid guy to a happy playful boy. He loves to "play-bow" and does it several times a day, especially when he wants to get your attention. He is a great observer and loves to take in his surroundings and people. One of his cutest features happens when he doesn't understand what you want him to do or when someone he doesn't know comes in the house. He wrinkles his forehead and seems to say "What's going on now, should I be worried???" We reassure him that he is a very good boy! He also stares right in your eyes and seems to totally understand what you are saying if he thinks it involves him. He runs to greet us when we walk in the door. We do have a dog door but when he first arrived, he stood at the back door to let us know he needed to go out. He now uses a dog door well but will still go to the door and wait at times. He loves to follow us around the house and is a pro at going up and down the stairs. This wonderful guy would do very well in a quiet home with no small children as he is somewhat reserved and loves quiet places. He loves his adult people and I feel he will be more confident if there's another dog in the home. He loves companionship and once he's comfortable he has some fun "goofy" moments in him!